"Chinampa" 2015 Peter Ojstersek OpenArt Örebro. 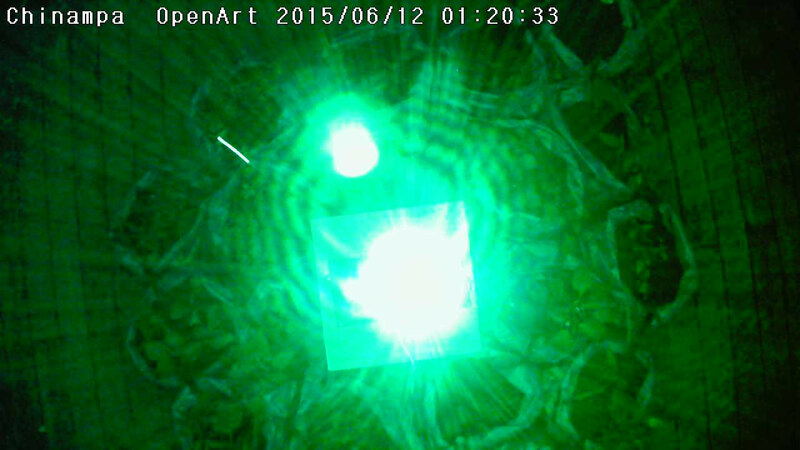 inside the dome are two LED spot lights installed. The light is programmed to make 60 minutes colour loops. Blue, Green, Yellow, Orange, Red and Purple. 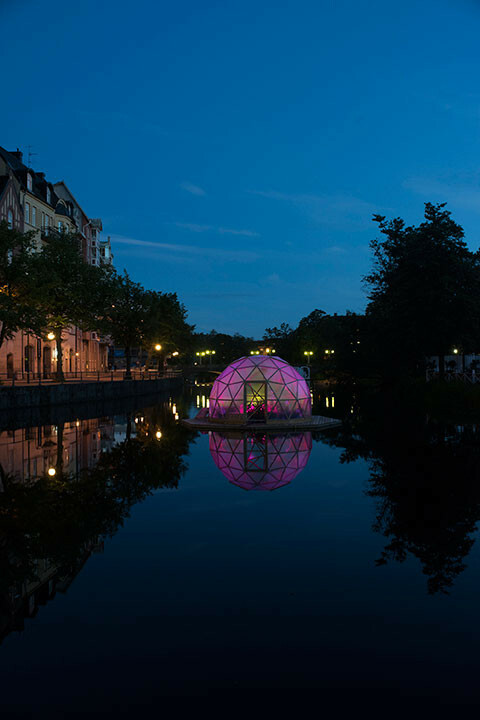 Night time the dome changes character and turns to a floating sculptural light watch. the river flowing through Örebro. 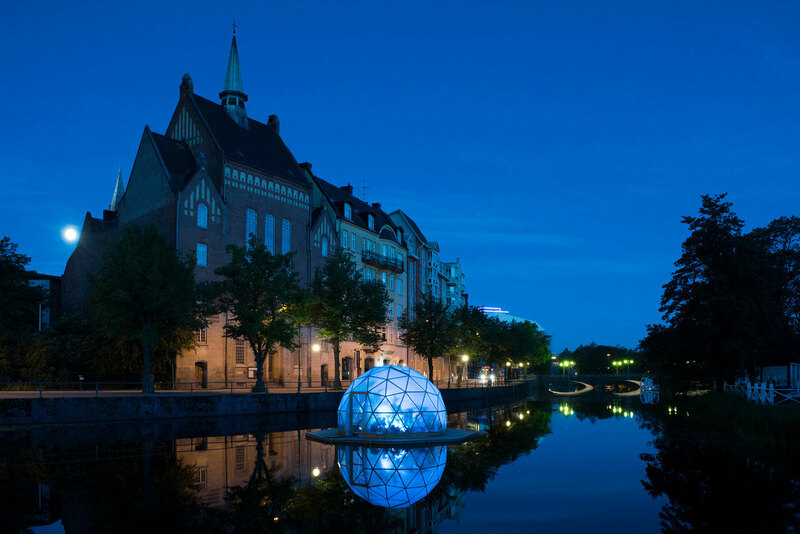 The dome is a sculptural work that is illuminated at night. Inside the dome, traditional Aztec crops like corn, beans and squash are grown, which are co-cultured by a method called “Three Sisters”. 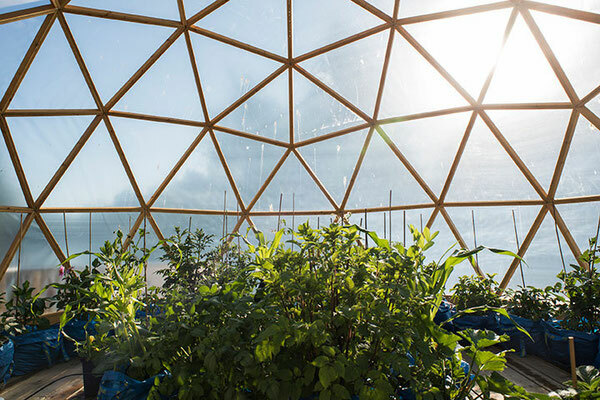 Amaranth, tomatoes, chili peppers, dahlias and potatoes are also cultivated inside the dome. Watering the plants is automated and electricity supply comes from solar panels and batteries. In recent years my focus and fascination for the natural world resulted in the work "Garden of Choice" 2014. This art work included 73 Dahlias in pots placed on square wheeled boxes. The audience was invited to be co-creators of the work; to arrange the Dahlias based on their own ideas concerning color, size, name, or other relevant criteria. The work in OpenArt, ”Chinampa” or ”Floating Garden”, features plants from Mexico and central America. ”Chinampa” is an artificial island built on shore in a shallow lake for agricultural purposes. 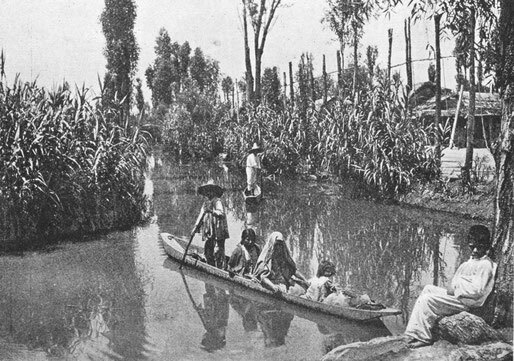 The Chinampas produced 2/3 of the crops for the Aztec capital Tenochtitlan which was built on an Island in Lake Texcoco that was surounded by cinampas. The planted crops from the Aztecs; maize, beans, squash, amaranth tomatoes chili peppers and flowers; is today’s staple food. For OPENART,”Chinampa” is a of grid geodesic dome, placed on a raft, anchored in the river Svartån, and floating through Örebro city. 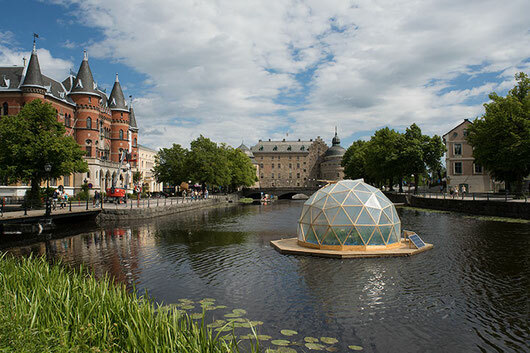 The dome is a sculptural work illuminated in the night time. It houses the traditional Aztec crops: maize, beans, and squash which are planted together, a method of companion planting called ” Three Sisters”. In addition amaranth tomatoes chili peppers, Dahlia flowers and potaoes are planted. The irrigation is automatic and the power supply is supported from solar panels with support from Göteborg Energi DinEl miljöfond. following ”Chinampa” both from outside and inside. 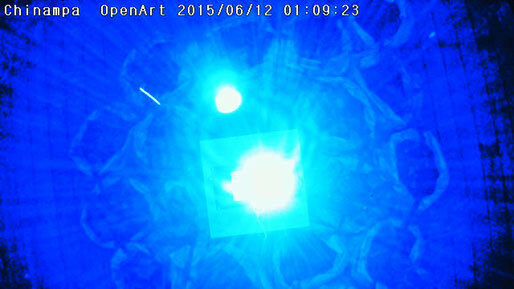 The survillence camera takes one picture each hour or registers movement inside the dome. 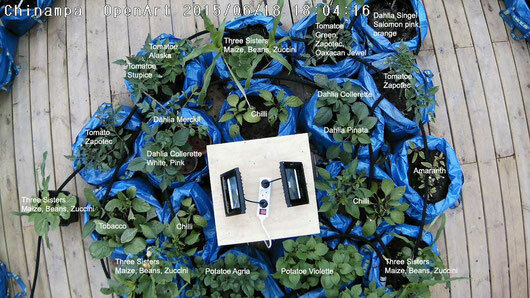 The surveillance camera makes it possible to follow the plant growth through the exhibition. This work is a visualization of issues surrounding environment, art, cultural history, food, technology, and monitoring. 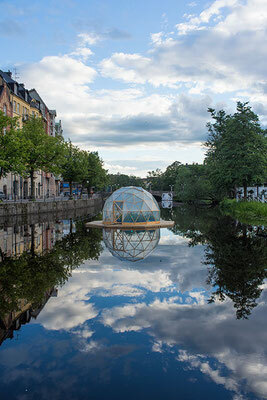 "Chinampa" 2015 Peter Ojstersek, OpenArt Örebro. Photo: Samuel Huber. Located in the river Svartån in Örebro city Sweden. Illuminated Dome, Night time the dome gives the audience to relate colour and time. in centre of the dome. planted in IKEA bags with soil. Surveillance takes a picture every hour put together to a video up dated twice a week. Follow the growth of the plants. 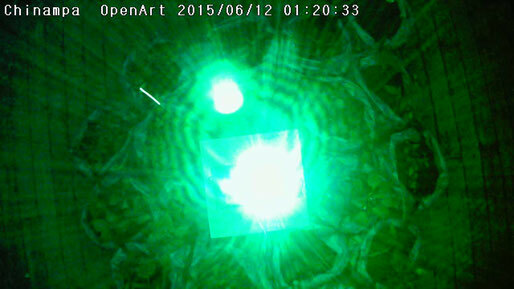 RGB led light illuminating the dome and changing colour in 1h cycles.